First to keep track of what I'm doing: The bunny pen is *almost* done, just gluing the joints together, which is a little more painful then it should be. 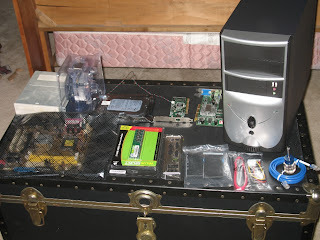 Now onto my new computer...what originally was going to be a cheapy sub $100 encryption backend, has now ended up costing over $300($80 HD, $85 CPU, $25 RAM, $80 MOBO, $35 Case) and is insanely overpowered and now replacing my old computer. 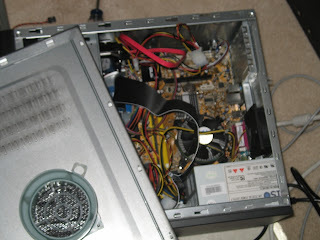 Dual Core Pentium D processor, with .5GB 800mhz DDR2 RAM, and SATA 300 harddrive. 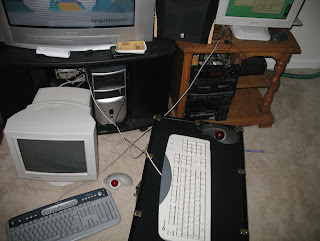 Couple that with buying the most expensive DSL service available, and it's a completely different computing experience. I had really doubted whether or not it would make a big difference, but I've noticed on average really system intensive stuff like emerge goes roughly 6 times faster than it used to. Also I couldn't imagine not having a multi-core/cpu system anymore, since that seems to make the biggest difference in performance. Basically, any new process picks the core with the least load on it, so for example if you are generating a big encryption key you won't notice any sluggishness when opening other applications since it's running on a completely different core. This more or less eliminates the need for a separate machine for encryption like I originally wanted to do. One weird thing with SMP(Symmetric Multi-Processing) is with emerge. It uses both cores simultaneously. I think I figured out what it's doing though. It seems to calculate the dependencies for compiling and pick any 2 that aren't dependent on one another and ready to be compiled and do both simultaneously. You can tell when it runs out of these since there will be large gaps in one core while it waits on the compilation of the other to complete. There are a few problems with having bleeding edge equipment though. The biggest dissappointment is the SATA 300 harddrive, which is what I originally based the system around. It's speed is definitely faster then the fastest PATA devices, but not by leaps and bounds. After some research it just appears that not everything is 100% supported yet since they are so new, so hopefully in a couple months I can get a little more speed out of it. Another thing is that the built in NIC refuses to be seen by any version of Linux. My assumption is that the chip isn't supported yet, or at least not in any stable branches. This isn't a big deal since I have tons of PCI NICs, but only the newest kernel versions can support my PCI bus. I've had to use alot of things marked Experimental in the kernel, since they are recent additions. The hardware sensor monitor, just supports temp and fan speeds, but the kernel notes that it supports alot more info that will soon be supported. Also another weird thing, that I don't know if it's common, is a dedicated random number generator chip, which I'm currently not using, but is still interesting. The onboard soundcard, seems to be anti-supported...very few versions of Linux I tried hit it properly(They see it, but everything generates a horrible high pitched noise), and their are very few channels available to adjust in ALSA, another thing I hope is better in a few months. Eventually I'd like to put in a little more memory, since I use about 80% of it now, and *maybe* a new graphics card, although they are so expensive and moderately unecessary(Since the onboard one seems to do everything just fine). And to the 3 whole readers besides myself: Next installment you can look forward to exceedingly technical babble about the ridiculous way the system is set up. Think tin-foil hat levels of encryption and programs/scripts to smoothly perform RBAC control, as well as dockapps galore!